Many of you are familiar with my Advent calendar. We use it to count down to Christmas. The kids love it since it promotes family time and they get to do a different activity every day. You can read about it here. I was on Facebook the other day and on my feed I saw a post from coffecupsandcrayons.com You can read the post here. 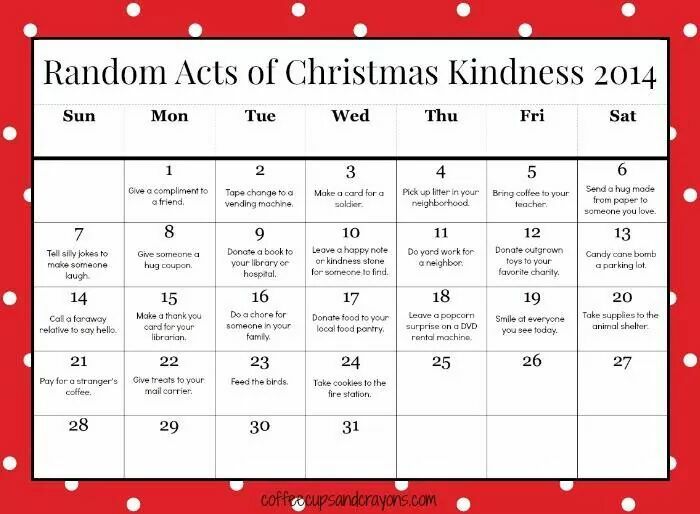 They suggest doing random acts of kindness this advent season and I think it’s a great idea, one that promotes the true meaning I’d Christmas –giving. This is a very difficult holiday season for my family and I felt that this is a beautiful thing to do to celebrate kindness and giving. I hope that you will join us in doing this or your own random acts of kindness.